Del Webb Orlando offers over 30,000 square feet of luxury amenities and an exciting social lifestyle. 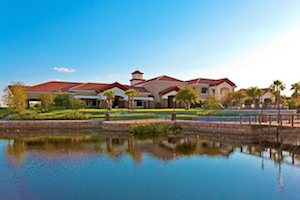 Located in beautiful Davenport, Florida, Del Webb Orlando offers a scenic retreat for active adults aged 55 or better. This lovely community features a wide range of indoor and outdoor amenities, while social clubs and special-interest groups make it easy for residents to get to know their neighbors. Del Webb Orlando was originally opened in 2007, under the name La Cresta by Del Webb. The community is still under development with plans for approximately 830 single-family homes. Interested homebuyers can currently choose from available resale and new construction homes in floor plans designed to meet the needs of many different active adults. Del Webb Orlando is a gated enclave set within the larger Ridgewood Lakes golf community. Resident golfers enjoy easy access to the public 18-hole Ridgewood Lakes Golf Course, while even non-golfers can benefit from the golf course's rolling hills and scenic water features. Beyond golf, Del Webb Orlando has plenty of its own amenities as well. Social and recreational activities at Del Webb Orlando are largely centered around the Montecito Clubhouse. This 30,800 square-foot facility brings residents together with inviting social areas, such as cards and billiards rooms, an arts and crafts studio, a Wall Street room and the Cyber Cafe Coffee Bar. The clubhouse is the ideal place for special-interest groups to meet, while a spacious ballroom is available for parties and community events. Residents can enjoy the beautiful Florida weather lounging by this large resort-style swimming pool. The Montecito Clubhouse's state-of-the-art fitness center includes the latest in cardiovascular and strength-training equipment. It also features a separate aerobics and dance studio, an indoor walking track and an indoor swimming pool. Del Webb Orlando's scenic grounds let residents enjoy the sunny Florida weather. They can swim in the beautiful outdoor pool, relax in the spa or lounge on the sundeck. Sports courts support many activities, including tennis, pickleball, bocce ball, basketball and horseshoes. There are also picnic areas, parks, gardening plots, a pet park, an outdoor amphitheater, a fishing lake and 12 miles of walking and biking trails. Single-family homes at Del Webb Orlando span a range of sizes and styles. Homes built from the Generation One Series are sized from 1,515 to 2,251 square feet. They include two to four bedrooms, two to three bathrooms and two-car garages. These homes are now only available on a resale basis. Homebuyers who want the option of a new-construction or resale home, can turn to either the Garden Series or Classic Series. Homes in the Garden Series feature compact floor plans, ranging from 978 to 1,433 square feet. Depending on the model, they include one or two bedrooms, one-and-a-half or two bathrooms and a one or two-car garage. Homes in the Classic Series are larger, with optional second-story lofts. Floor plans are sized from 1,598 to 2,831 square feet. They may include two to four bedrooms, two to four bathrooms and a two-car garage. Many floor plans also have the option of a separate den. 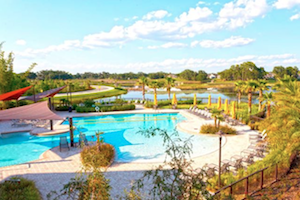 With appealing homes, impressive amenities and beautiful grounds, it's easy to see why Del Webb Orlando is a popular option for active adults in the Central Florida area.